Bardzo dobry smak,łatwa rozpuszczalność,nie zalega na żołądku.Co chcieć więcej po gainerze? Take 1-4 portions a day – during breakfast, dinner, after training and around 1 hour before sleep. Take 1-3 portions – during breakfast, dinner and around an hour before sleep. 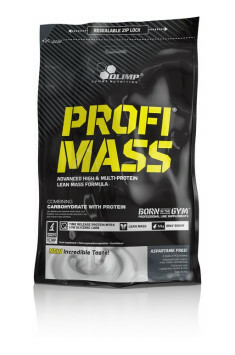 Profi Mass nutrient is especially attractive for people who have problems with providing the right amount of calories in their diet. To ensure a positive caloric balance, it is worth using this product between meals. The best time for supplement consumption will be the post-workout period, due to the content of beneficial ingredients with immediate effect on the level of glucose and amino acids in the blood. The nutrient should be used as part of diet supplementation, therefore dosage should be adjusted individually. It is a product with high nutritional density, so be careful when consuming larger portions at once, or consider introducing them gradually. In order to improve the development of strength and muscle mass, it is worth using the product together with a creatine preparation. Dietary supplement facilitating the growth of muscle mass. It limits the adverse effect of estrogens.